A simple way to round off answers is to carry your final answer one more decimal place than was present in the original data. Round off only the final answer. Do not round off any intermediate results, if possible. If it becomes necessary to round off intermediate results, carry them to at least twice as many decimal places as the final answer. For example, the average of the three quiz scores four, six, and nine is 6.3, rounded off to the nearest tenth, because the data are whole numbers. Most answers will be rounded off in this manner. The differences between the data have meaning. The score 92 is more than the score 68 by 24 points. Ratios can be calculated. The smallest score is 0. So 80 is four times 20. The score of 80 is four times better than the score of 20. Twenty students were asked how many hours they worked per day. Their responses, in hours, are as follows: 56332475235654435253. A frequency is the number of times a value of the data occurs. According to [link], there are three students who work two hours, five students who work three hours, and so on. The sum of the values in the frequency column, 20, represents the total number of students included in the sample. the relative frequency for the current row, as shown in [link]. From [link], find the percentage of heights that are less than 65.95 inches. If you look at the first, second, and third rows, the heights are all less than 65.95 inches. There are 5 + 3 + 15 = 23 players whose heights are less than 65.95 inches. The percentage of heights less than 65.95 inches is then or 23%. This percentage is the cumulative relative frequency entry in the third row. [link] shows the amount, in inches, of annual rainfall in a sample of towns. From [link], find the percentage of rainfall that is less than 9.01 inches. From [link], find the percentage of heights that fall between 61.95 and 65.95 inches. Add the relative frequencies in the second and third rows: 0.03 + 0.15 = 0.18 or 18%. From [link], find the percentage of rainfall that is between 6.99 and 13.05 inches. Use the heights of the 100 male semiprofessional soccer players in [link]. Fill in the blanks and check your answers. The percentage of heights that are from 67.95 to 71.95 inches is: ____. The percentage of heights that are from 67.95 to 73.95 inches is: ____. The percentage of heights that are more than 65.95 inches is: ____. The number of players in the sample who are between 61.95 and 71.95 inches tall is: ____. From [link], find the number of towns that have rainfall between 2.95 and 9.01 inches. False. The frequency for three miles should be one; for two miles (left out), two. The cumulative relative frequency column should read: 0.1052, 0.1579, 0.2105, 0.3684, 0.4737, 0.6316, 0.7368, 0.7895, 0.8421, 0.9474, 1.0000. [link] represents the amount, in inches, of annual rainfall in a sample of towns. What fraction of towns surveyed get between 11.03 and 13.05 inches of rainfall each year? [link] contains the total number of deaths worldwide as a result of earthquakes for the period from 2000 to 2012. [link] contains the total number of fatal motor vehicle traffic crashes in the United States for the period from 1994 to 2011. 75.1% of all fatal traffic crashes for the period from 1994 to 2011 happened from 1994 to 2006.
http://statistics.about.com/od/HelpandTutorials/a/Levels-Of-Measurement.htm (accessed May 1, 2013). What type of measure scale is being used? Nominal, ordinal, interval or ratio. Fill in the blanks in [link]. Sixty adults with gum disease were asked the number of times per week they used to floss before their diagnosis. The (incomplete) results are shown in [link]. Nineteen immigrants to the U.S were asked how many years, to the nearest year, they have lived in the U.S. The data are as follows: 257221020150702051215124510. The 47% is the Cumulative Relative Frequency, not the Relative Frequency. 47% of the people surveyed have lived in the U.S. for five years or less. How much time does it take to travel to work? [link] shows the mean commute time by state for workers at least 16 years old who are not working at home. Find the mean travel time, and round off the answer properly. The sum of the travel times is 1,173.1. Divide the sum by 50 to calculate the mean value: 23.462. Because each state’s travel time was measured to the nearest tenth, round this calculation to the nearest hundredth: 23.46. Forbes magazine published data on the best small firms in 2012. These were firms which had been publicly traded for at least a year, have a stock price of at least 5 per share, and have reported annual revenue between 5 million and 1 billion. 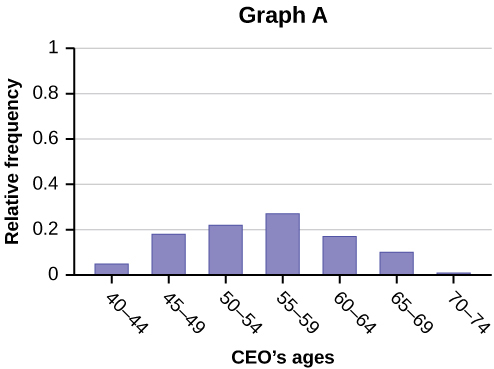 [link] shows the ages of the chief executive officers for the first 60 ranked firms. 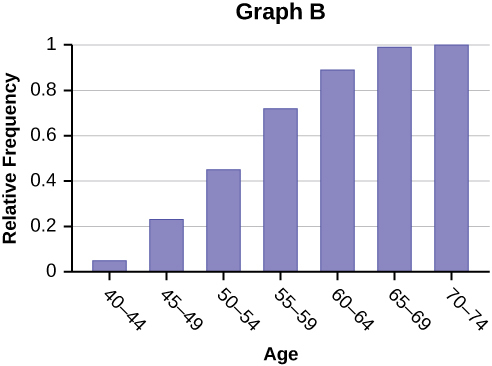 Graph A represents the cumulative relative frequency, and Graph B shows the relative frequency. Use the following information to answer the next two exercises:[link] contains data on hurricanes that have made direct hits on the U.S. Between 1851 and 2004. A hurricane is given a strength category rating based on the minimum wind speed generated by the storm. The term applies to an ordered set of observations from smallest to largest. The cumulative relative frequency is the sum of the relative frequencies for all values that are less than or equal to the given value. Frequency, Frequency Tables, and Levels of Measurement by OpenStaxCollege is licensed under a Creative Commons Attribution 4.0 International License, except where otherwise noted.